Feeling Low? 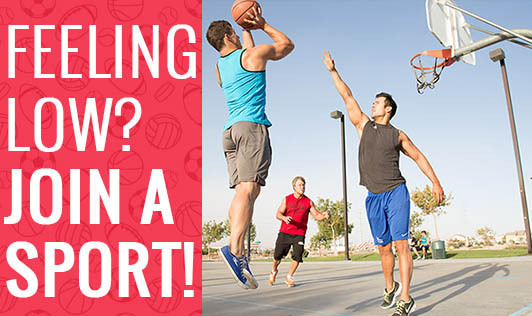 Join a Sport! Tired of the same old routine...the same old exercises....and the same old weight? Joining a sport of your choice will help break that monotony! Sometimes we get caught up in the day-to-day activities so badly that our thinking becomes limited. We are not able to think in a different way. Taking up a sport can actually help you feel rejuvenated, fresh and enthusiastic about absolutely everything you do! Choose a sport which suits your lifestyle well, or which will not harm you in any way. For example, if you are obese, go for non weight bearing sports such as swimming or cycling, so that it doesn't harm your knees or ankles. You can also go for sports like Badminton, Table Tennis, Lawn Tennis, Squash, etc. These sports will add up to your physical activity, helping you burn a good amount of fat! These will also help you feel better and happier, as these activities increase serotonin secretion, the feel good hormone! So, that's double the benefit already! If you have back pain, neck pain, wrist pain, knee pain or ankle pain; better consult a physiotherapist before joining any sport. Carom, is another sport which can give you mental relaxation when you are saturated with work related stress. Sports give you that rare opportunity to spend quality time with your kids too. Play carom, badminton or table tennis with them on weekends and they will be glad to have you around! Your office might already have facilities required for most of the above mentioned sports. You might not have noticed it or just ignored it due to work pressure. It’s time to break the monotony and enjoy everything you do in life! Give your mind a boost... Join a sport!